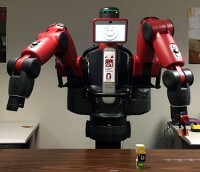 As robotics technology evolves to a stage where co-robots, or robots that can work with humans, become a reality, we need to ensure that these co-robots are equally capable of interacting with humans with disabilities. This project addresses this challenge by exploring meaningful human-robot interaction (HRI) in the context of assistive robots for blind travelers. Project work will begin with stakeholder interviews and task shadowing to help identify high value robot tasks and functional constraints. We anticipate generating new knowledge on how to support interactions between co-robots and visually impaired travelers through this project. We also hope to make advances in the areas of multi-robot skill coordination and crowdsourcing assistance to robots, and to produce peer-review publications as well as infusions into classes and outreach programs. How Would You Describe Assistive Robots to People Who are Blind or Low Vision?